HONOLULU -- Long flights can leave anyone a little unsteady, but a teenager who defied the odds, surviving a flight from California to Hawaii tucked in a jetliner's wheel well, was disoriented, thirsty and could barely walk after the freezing, low-pressure ordeal, airport officials said Wednesday. Security video of his arrival shows the 15-year-old boy dangling his feet for about 15 seconds from the wheel well before jumping 8 to 10 feet to the ground, landing on his feet and immediately collapsing Sunday morning, Maui District Airport Manager Marvin Moniz said. Staggering toward the front of the plane, the soft-spoken boy in a San Francisco Giants hoodie asked a ramp agent for a drink of water, setting in motion federal and local law enforcement investigations, national calls for better airport security and a flurry of speculation about how anyone could survive such a perilous trip. 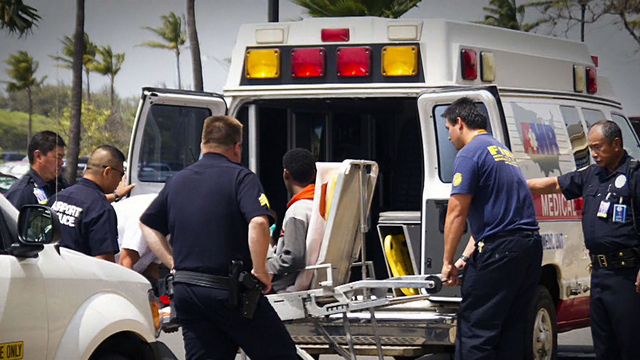 Abdilahi Yusuf Abdi, who said he is the boy's father, told Voice of America Wednesday that his son - who is still hospitalized in Honolulu - missed Africa, where they used to live, and had been struggling in school. Abdi said he learned of the perilous journey Sunday when he got a call from police in Hawaii, but he couldn't understand how he got to Maui and asked them to contact the San Jose Police Department. "When I watched the analysis about the extraordinary and dangerous trip of my son on local TVs and that Allah had saved him, I thanked God and I was very happy," Abdi said. The Associated Press was unable to reach Abdi, who airport officials say drives a taxi. After the boy was discovered in Maui, FBI and Transportation Security Administration investigators questioned him and fed him like a local with teriyaki meatballs and rice from an airport restaurant and a box of Maui macadamia nut cookies. The teen, whose name has not been released, said he had been in an argument at home, went to the airport, and got onto the first plane he came to. "He didn't realize he was in Maui - not at all," Moniz said. The boy told officials he evaded what was supposed to be a multi-layered airport security system in San Jose by climbing a fence. That hasn't surprised airport security experts, who say that for all the tens of billions of dollars the nation has spent screening passengers and their bags, few airports made a comparable investment to secure the airplanes parked on the tarmac. "No system is foolproof," said San Jose International Airport aviation director Kim Aguirre. "Certainly as we learn more, if we see any gaping holes, we will work to fill them." Aguirre said a perimeter search found no holes or crawl spaces in the barbed-wire fence surrounding the 1,050-acre airport. "Something broke down here," CBS News national transportation safety expert Mark Rosenker said. "Maybe we need to be spending more time looking at the outside of our airports and the perimeters of those airports, given the fact that we've seen a successful breach." Airport perimeter breaches are far from rare. In 2012 a Philadelphia driver crashed through a gate onto an active runway, and a similar incident occurred that year at Sky Harbor International Airport. Last Christmas a man climbed a fence at the same airport in Phoenix and ran across the tarmac. In addition, a Congressional report revealed that during the decade immediately following 9/11, the nation's airports investigated almost 1,400 perimeter breaches. "Each of these airports have their own geographical features that are unique and have to be looked at to make sure that the breaches cannot be done," Rosenker said. Santa Clara High School Principal Gregory Shelby sent a note Tuesday to staff saying the teen has been in the U.S. for about four years, speaks English as his second language and had transferred into the district five weeks earlier, according to Jennifer Dericco, a spokeswoman for the Santa Clara Unified School District. That the teen survived is remarkable. At a cruising altitude of 38,000 feet, temperatures would have been well below zero and the air so starved of oxygen that he likely passed out. In response, his body could have entered a hibernation-like state, experts say. The TSA said it has spent $80 billion on aviation security since its inception shortly after the 9/11 attacks. That does not include perimeter security. "We were investing all our resources in the front door, which were the passengers and their bags," Ron said. "And we left the back door open."